KPU students can receive face-to-face tutoring support from the Learning Centre for free. In addition to English-language tutoring, the Learning Centre offers Bilingual Tutoring as well at select campuses. 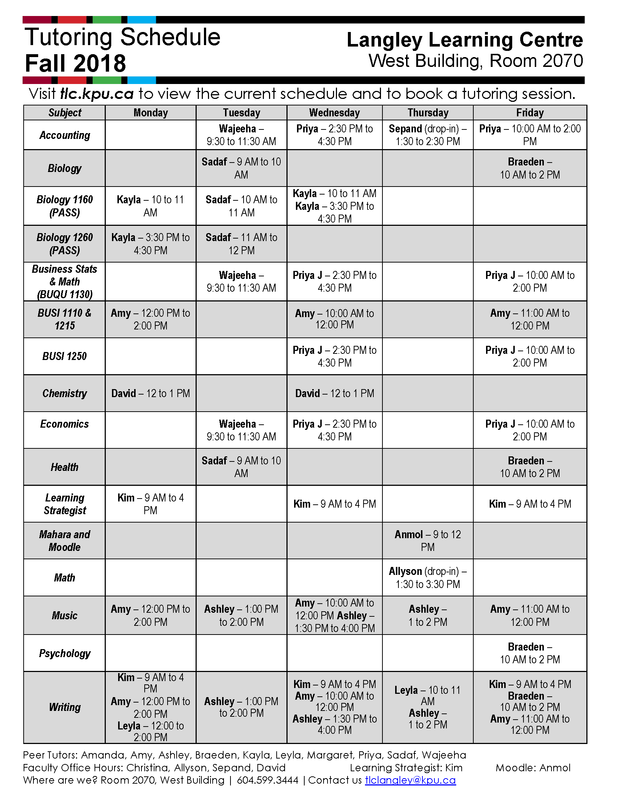 For more information, and to schedule a tutoring session today, click on the links below to access our tutor scheduling system. In addition to face-to-face writing tutoring support, the Learning Centres provides KPU students with access to two online writing feedback services. Both services allow KPU students to submit writing assignments online to receive written feedback from a trained writing tutor. Please note that both services typically take 2-3 business days for submissions to be reviewed and feedback returned. How do I book a tutoring appointment? When should you use the tutoring service? What learning supports do we offer? The Learning Centres offer various supports for students. Please read this Learning Support Services handout outlining the various supports that you can access at the Learning Centres. All the various supports that you can access at the Learning Centres. To continue providing students with high quality service, we conduct ongoing peer tutor evaluation service assessments each semester. Please take a few minutes to complete this Tutor Feedback Form. All submissions are anonymous and confidential.